Successfully Added Yantouch Black Diamond 3D Ambience Dock for iPhone to your Shopping Cart. 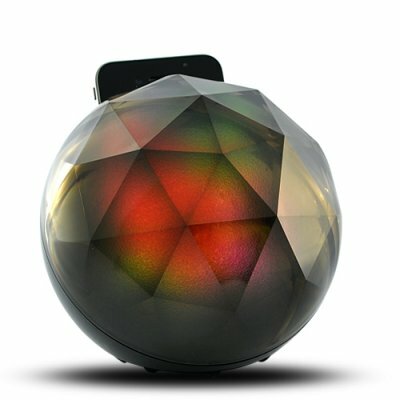 Chinavasion partners with Taiwan-based hi-tech company Yantouch to bring you the new Black Diamond 3D Ambience iPhone Dock, a stylish accessory that instantly turns your iPhone into a colorful mood light. Gorgeous Hardware: Even when not used, the Black Diamond is a sleek spherical black diamond. A half-faceted, half-globe-shaped dock made from translucent black plastic, it comes with a slot in the top and a Dock Connector plug inside to fit any iPhone model (without a case). The two holes in the bottom will pass through speaker and microphone sound from the docked iPhone. Every bit of the Black Diamond is artistically crafted with painstaking attention to details. Magical Software:It’s with the Black Diamond App enabled on your iPhone that the magic begins. Simply go to the iTunes Store, download and run the free app, and slide your iPhone in the Black Diamond. The sound that comes out of your phone will then be transformed into 3D ambience, creating interesting light patterns and an atmosphere that breathe life into any gloomy environment. The app even lets you choose from Plasma, Breath, Rainbow, Lightning, Flames, or Remix effects, to suit your mood. Now a hot item widely reviewed by gadget magazines, forums, the Black Diamond is bound to be the new cash cow on your online store. Order today while stock lasts. It’s brought to you by Yantouch and Chinavasion, with a 12 month product warranty, and guaranteed next day delivery. The Black Diamond App can be downloaded through iTunes. Go to www.apple.com/iTunes, and search Yantouch, Black Diamond. It’s free of charge and can be downloaded within seconds. Additional features of the Black Diamond App including alarm, wake up and sleep mode, etc.Updated versions may also be downloaded free of charge from iTunes Store.